Cash for Junk Cars Clearwater FL pays cash when you want to junk your cars, trucks or boats in Clearwater , Largo and throughout Pinellas County, but we have recently expanded our junk car buying services throughout Tampa Bay. When you are looking to junk your car in Tampa, Clearwater, Largo, St. Pete, Pinellas Park or Safety Harbor, we’ve been there too, paying top dollar for vehicles. If you are out of these areas, please call us! We want to help you junk your and we will do what we can to provide you with our reliable vehicle removal services. Below are the most common areas we serve, but don’t hesitate to call us directly if you want to junk your car for cash in Florida. Don’t forget, we also can junk your boat or RV, something many salvage dealers do not do. 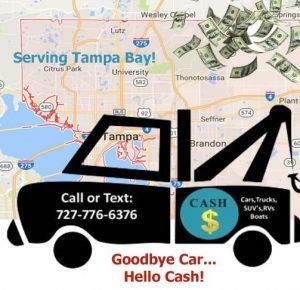 Tampa Cash for Cars – From South to Central Tampa, Ybor City to Temple Terrace. We provide service throughout Tampa Bay! Tampa, New Tampa, Central Tampa, South Tampa – Expanded Service Area! Now Paying Cash for Junk Cars in Tampa FL with FREE Towing! WE MAKE IT SIMPLE to Junk Your Car in Tampa, Clearwater, St. Pete! WAVE “BYE-BYE” AS WE TOW YOUR UNWANTED VEHICLE AWAY FOR FREE! Scrapping your old vehicle in Tampa or Clearwater has never been easier. Don’t pay for towing when you can keep the cash we pay you for your old vehicle in your own pocket! Call 727-776-6376 for more information, or simply text us for an offer! Junk my Car Clearwater FL © 2019. All Rights Reserved. Junk your car for cash, Clearwater to Tampa, FL. Getting Cash for Cars, Trucks, Boats, RV's is Easy! Tampa Bay FL Auto Salvage Company.